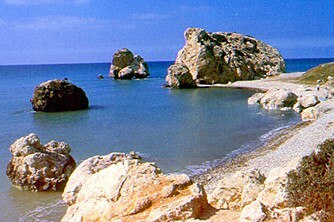 ""Tucked away in the easternmost corner of the Mediterranean Sea lies Cyprus. An island republic of spectacular beauty with sandy beaches enclosed by rugged cliffs, cool cedar forests, scented orange groves and gentle meadows blanketed in wildflowers. A sophisticated country, whose nine-thousand-year cultural legacy infuses East and West. An historic island, the third largest in the Mediterranean, where modern travelers retrace the footsteps of figures as diverse as St. Paul, Alexander the Great and Leonardo da Vinci. And a romantic island, once Anthony’s gift to Cleopatra and where, according to mythology, the goddess Aphrodite first emerged from the sea." 7000 BC, the Neolithic Age, with settlements along the north and south coasts of the island. 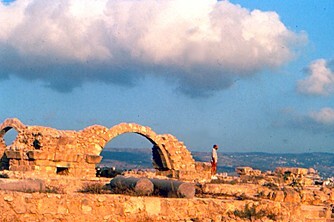 1400 BC, the first Mycenaen merchants came to the island. 1050 BC Greek language, culture & religion well established. 750 BC Cyprus conquered several times by Assyria, Egypt and Persia. 333 BC Alexander the Great claims Cyprus for part of his empire. 58 BC Cyprus becomes part of the Roman Empire. 1191 AD Cyprus is defeated by the crusader Richard the Lionheart. The island is then sold to the Knights Templar. 1489 control of the island passes to the Venetians. 1571 Cyprus becomes part of the Ottoman Empire. Islam is introduced to the island The Greek Orthodox religion is restored. 1878 Britain assumes administration of the island although it remains part of the Ottoman Empire. 1914 When the Ottomans entered the 1st World War on the side of the Germans, Britain annexed the island. 1960 The island is granted independence.1974 the Greek junta instigates a coup and Turkey uses that as an excuse and invades the island. "Its beginnings date back 5000 years to the Bronze Age. It lies roughly in the centre of the island, flanked by the beautiful northern range of Kyrenia mountains with its distinctive five finger mountain. There are various suggestions as to the origin of the name Nicosia - or 'Lefkosia' In Greek - but the most likely one is linked to the popular tree, the tall 'Lefki ' which once adorned the city.